Garrett Leight Hampton - Demi Blonde + Clip (Eye) Need Help? A flawless design and the GLCO take on the original acetate P3 shape. 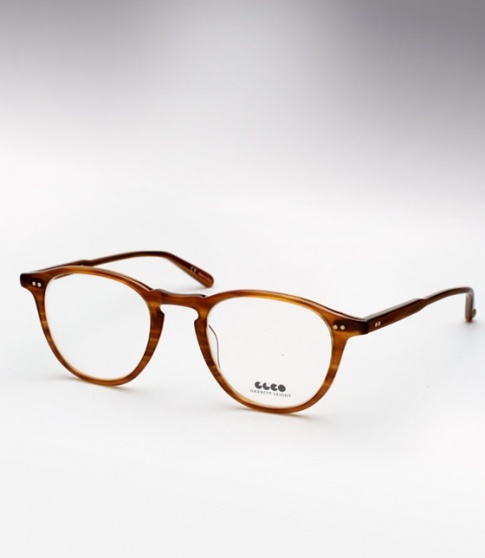 The shape, which originated when glasses were first designed for style, has the signature GLCO touch with the one of a kind vintage acetate from Japan and custom 5 barrel hinges. Hampton is an undoubtedly recognizable and sophisticated piece. Wear it as an eyeglass or a sunglass -- The Hampton’s originality is taken a step further with a one of a kind folding acetate sunglass clip. An original design that is the perfect combination of fashion and function. The Hampton is offered here in "Demi Blonde" with a "Demi Blonde" clip. Comes with a foldable acetate sunglass clip (which can quickly/easily be put on).